A Canadian postal code is a six-character string that forms part of a postal address in Canada. Like British, Irish and Dutch postcodes, Canada's postal codes are alphanumeric. They are in the format A1A 1A1, where A is a letter and 1 is a digit, with a space separating the third and fourth characters. As of September 2014, there were 855,815 postal codes using Forward Sortation Areas from A0A in Newfoundland to Y1A in the Yukon. Canada Post provides a free postal code look-up tool on its website, via its mobile application, and sells hard-copy directories and CD-ROMs. Many vendors also sell validation tools, which allow customers to properly match addresses and postal codes. Hard-copy directories can also be consulted in all post offices, and some libraries. When writing out the postal address for a location within Canada, the postal code follows the abbreviation for the province or territory. 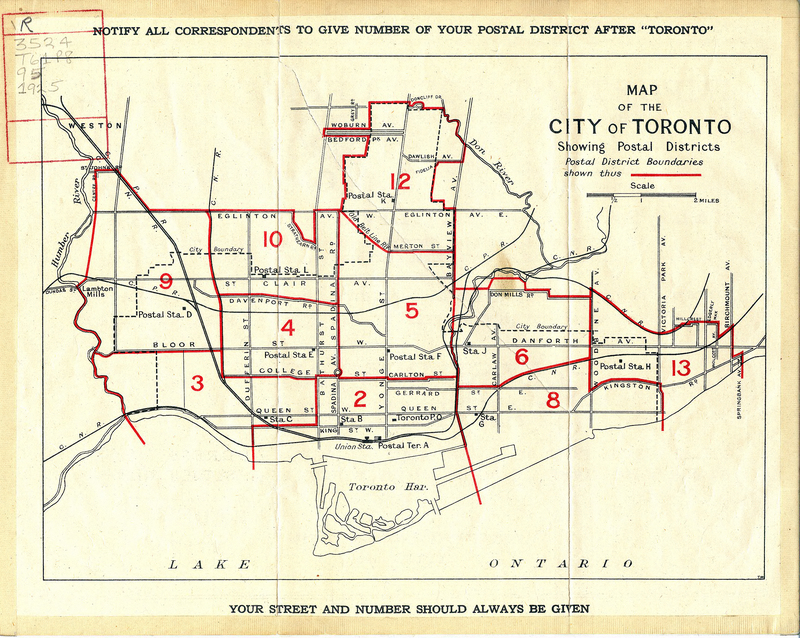 As of 1943, Toronto was divided into 14 zones, numbered from 1 to 15, except that 7 and 11 were unused, and there was a 2B zone. Postal zones were implemented in Montreal in 1944. Toronto's renumbering took effect 1 May 1969, accompanied by an advertising campaign under the slogan "Your number is up". However, with impending plans for a national postal code system, Postmaster General Eric Kierans announced that the Post Office would begin cancelling the new three-digit city zone system. Companies changed their mail addressing at their own expense, only to find the new zoning would prove to be short-lived. As the largest Canadian cities grew in the 1950s and 1960s, the volume of mail passing through the country's postal system also grew, to billions of items by the 1950s and tens of billions of items by the mid-1960s. Consequently, it became progressively more difficult for employees who handsorted mail to memorize and keep track of all the individual letter-carrier routes within each city. New technology that allowed mail to be delivered faster also contributed to the pressure for these employees to properly sort the mail. A report tabled in the House of Commons in 1969 dealt with the expected impact of "environmental change" on the Post Office operations over the following 25 years. A key recommendation was the "establishment of a task force to determine the nature of the automation and mechanization the Post Office should adopt, which might include design of a postal code". In December 1969, Communications Minister Eric Kierans announced that a six-character postal code would be introduced, superseding the three-digit zone system. He later tabled a report in February 1970, entitled "A Canadian Public Address Postal Coding System", submitted by the firm of Samson, Belair, Simpson, Riddell Inc. The introduction of the postal code began with a test in Ottawa on 1 April 1971. Coding of Ottawa was followed by a provincial-level rollout of the system in Manitoba, and the system was gradually implemented in the rest of the country from 1972 to 1974, although the nationwide use of the code by the end of 1974 was only 38.2 per cent. The introduction of such a code system allowed Canada Post to easily speed up and simplify the flow of mail in the country, with sorting machines being able to handle 26,640 objects an hour. The Canadian Union of Postal Workers objected to the automated sorting system mainly because the wages of those who ran the new automated machines were much lower than those who had hand-sorted mail. The unions ended up staging job action and public information campaigns, with the message that they did not want people and business to use postal codes on their mail. The union declared 20 March 1975 National "Boycott the Postal Code" Day, also demanding a reduction in the work week from 40 to 30 hours. The boycott was called off in February 1976. Please include them on the bottom." The advertisement was denounced as "sexist garbage" in the House of Commons by NDP MP John Rodriguez, prompting an apology from Postmaster General Bryce Mackasey. Canada was one of the last Western countries to get a nationwide postal code system. A forward sortation area (FSA) is a geographical region in which all postal codes start with the same three characters. The first letter of an FSA code denotes a particular "postal district", which, outside Quebec and Ontario, corresponds to an entire province or territory. Owing to Quebec's and Ontario's large populations, those two provinces are sub-divided into three and five postal districts respectively, and each has at least one urban area so populous that it has a dedicated postal district ("H" for the Montreal region, and "M" for Toronto). On the other hand, the low populations in Nunavut and the Northwest Territories (NWT) mean that even after Nunavut separated from the Northwest Territories and became its own territory in 1999, they continue to share a postal district. The digit specifies if the FSA is urban or rural. A zero indicates a wide-area rural region, while all other digits indicate urban areas. The second letter represents a specific rural region, an entire medium-sized city, or a section of a major metropolitan area. A directory of FSAs is provided, divided into separate articles by postal district. Individual FSA lists are in a tabular format, with the numbers (known as zones) going across the table and the second letter going down the table. The FSA lists specify all communities covered by each rural FSA. Medium-sized cities may have one dedicated FSA, while larger cities have more than one FSA within their limits. For FSAs spanning more than one city, the city which is allocated the most codes in each such FSA is listed. For cities with a small number of FSAs (but more than one), the lists specify the relative location of each FSA in those cities. For cities with a large number of FSAs, applicable neighbourhoods and boroughs are specified. 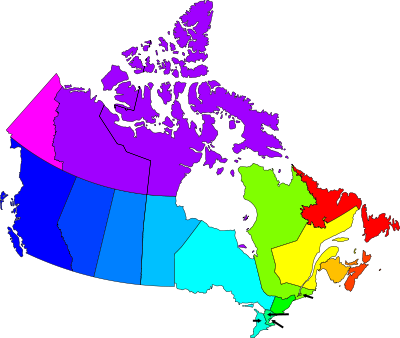 All Canadian postal codes are listed in the following links, organized by first letter. The last three characters denote a local delivery unit (LDU). An LDU denotes a specific single address or range of addresses, which can correspond to an entire small town, a significant part of a medium-sized town, a single side of a city block in larger cities, a single large building or a portion of a very large one, a single (large) institution such as a university or a hospital, or a business that receives large volumes of mail on a regular basis. LDUs ending in zero correspond to postal facilities, from post offices and small franchised retail postal outlets all the way up to sortation plants. In urban areas, LDUs may be specific postal carriers' routes. In rural areas where direct door-to-door delivery is not available, an LDU can describe a set of post office boxes or a rural route. LDU 9Z9 is used exclusively for Business Reply Mail. In rural FSAs, the first two characters are usually assigned in alphanumerical order by the name of each community. LDU 9Z0 refers to large regional distribution centre facilities, and is also used as a placeholder, appearing in some regional postmarks such as the "K0H 9Z0" which formerly appeared on purely local mail within the Kingston, Ontario area. Postal codes do not include the letters D, F, I, O, Q or U, and the first position also does not make use of the letters W or Z. This means the maximum number of FSAs available is 3,600. With 2,000 possible LDUs in each FSA, there is a theoretical limit of 7.2 million postal codes. The practical limit is a bit lower, as Canada Post reserves some FSAs for special functions, such as for test or promotional purposes, (e.g. the H0H 0H0 for Santa Claus, see below) as well as for sorting mail bound for destinations outside Canada. The current Statistics Canada estimate of over 830,000 active postal codes represents about 12% of the entire postal code "space", leaving more than ample room for expansion. "Urbanization" is the name Canada Post uses to refer to the process where it replaces a rural postal code (a code with a zero as its second character) with urban postal codes. The vacated rural postal code can then be assigned to another community or retired. Canada Post decides when to urbanize a certain community when its population reaches a certain level, though different factors may also be involved. For example, in early 2008, the postal code G0N 3M0 (covering Sainte-Catherine-de-la-Jacques-Cartier, Fossambault-sur-le-Lac and Lac-Saint-Joseph, Quebec) was urbanized to postal codes beginning with G3N to remove ambiguities and confusions caused by similar street names. Unique among province-wide districts, New Brunswick (postal district E) is completely urbanized, its rural codes having been phased out. In 1974, staff at Canada Post's Montreal office were noticing a considerable number of letters addressed to Santa Claus entering the postal system, and those letters were being treated as undeliverable. Since employees handling those letters did not want the writers, mostly young children, to be disappointed at the lack of response, they started answering the letters themselves. The amount of mail sent to Santa Claus increased every Christmas, up to the point that Canada Post established an official Santa Claus letter-response program in 1983. By 2011, Santa's mail was being handled with the assistance of eleven thousand volunteers, mostly current or former postal workers, at multiple locations across Canada devoting an average twenty-one hours to this seasonal task. The postal code H0H 0H0 was chosen for this special seasonal use as it reads as "Ho ho ho". The H0- prefix is an anomaly: the 0 indicates a rural delivery zone, but H is used to designate Montreal, the second-largest city in Canada. As such, the H0- prefix is almost completely empty. H0M, assigned to the international Akwesasne tribal reserve on the Canada-US border, is the only other H0- postal code in active use. In 2013, Santa was dragged into the ongoing Arctic sovereignty debate to support Canadian territorial claims extending to the North Pole. In response to attacks from Conservative MP Paul Calandra, parliamentary secretary to then-Prime Minister Stephen Harper, Justin Trudeau, at the time leader of the third party Liberals, stated "Everyone knows that Santa Claus is Canadian. His postal code is H0H 0H0." For transition of mail from the civilian to the Canadian Forces Postal Service, the postal codes of the three military post offices on Canadian soil are used, depending on the final destination. These postal codes each represent a number of military post offices abroad, which are specified not by postal code but by CFPO or FMO number. The LDUs in this case corresponding not so much to a physical as to a virtual delivery unit since mail is not delivered locally but is forwarded to the actual delivery units at Canadian military bases and ships abroad. In this example, Canada Post will deliver to the CFPO at Belleville and the Canadian Forces Postal System will continue transport to the addressee at CFPO 5053 (in Geilenkirchen, Germany) by whatever means and timing the military will deem appropriate. Postal codes can be correlated with databased information from censuses or health registries to create a geographic profile of an area's population. For instance, postal codes have been used to compare children's risk of developing cancer and to describe a neighbourhood's entrenched poverty ("Vancouver's Downtown Eastside is Canada's poorest postal code"). As Canadian electoral districts frequently follow postal code areas, citizens can identify their local elected representative using their postal code. Provincial and federal government websites offer an online "look-up" feature based on postal codes. Although A1A 1A1 is sometimes displayed as a generic code for this purpose, it is actually a genuine postal code in use in the Lower Battery, St. John's Harbour, Newfoundland. Another common "example" code in Canada Post materials, K1A 0B1, is the valid code for the Canada Post office building in Ottawa. ^ a b "Canada Postal Guide - Addressing Guidelines". Canada Post. 11 January 2016. Retrieved 11 January 2016. ^ "Canadian Postal Code Database". GreatData.com. Retrieved 27 September 2014. ^ Canada Post. "Canada Post - Find a Postal Code". Retrieved 11 April 2016. ^ "Mobile Apps". Canada Post. Archived from the original on 19 May 2011. ^ "Numbers Designate New Postal Zones". Toronto Star. 23 July 1925. p. 3. ^ "Montréal est divisé en 30 zones postales" (PDF). La Presse. 14 August 1944. p. 10. ^ "Postal Zone Numbers Speed Big City Mail". Ottawa Citizen. 25 February 1963. ^ Belford, Terrence (4 June 1969). "Costs of postal zone changes hit some companies second time". The Globe and Mail. p. B4. ^ "Technical advances in communications will erode Post Office work, report says". The Globe and Mail. 6 May 1969. p. A3. ^ Canadian Postal Museum (16 September 2001). "A Chronology of Canadian Postal History: The Postal Code (Archived version)". Archived from the original on 30 September 2007. Retrieved 7 January 2007. ^ "Postal coding in '70". Saturday Citizen. 24 December 1969. p. 50. ^ "To speed sorting and delivery: Proposed national postal code system for Canada". The Stanstead Journal. 26 February 1970. p. 5. ^ "Postal code service for Canada to be inaugurated on April first". The Stanstead Journal. 18 March 1971. p. 5. ^ Demarino, Guy (7 January 1975). "Will 'gentle persuasion' aid postal code?". Montreal Gazette. p. 9. ^ "New postal code for all of Canada to speed delivery and avoid errors". L'Avenir. 30 January 1973. p. 19. ^ "Boycotts Ordered: Postmen Declare Automation War". Saturday Citizen. 5 June 1974. p. 113. ^ Block, Irwin (7 June 1974). "Quick mail only without postal codes". Montreal Gazette. p. 5. ^ Boaden, Joan (19 March 1975). "Postal workers vote on contract demands". Montreal Gazette. p. 5. ^ Morissette, Michelle (17 September 1976). "Postal union chiefs claim pact violated, threaten to retaliate". Montreal Gazette. p. 3. ^ Rolfe, John (4 March 1972). "Cote denies conflict between ITT contract and personnel exchange with Post Office". The Globe and Mail. p. B3. ^ "NDG Presort Online Training". NDG. Canada Post. Archived from the original on 27 March 2009. Retrieved 23 September 2008. ^ Statistics Canada (October 2010). "Postal Code Conversion File (PCCF), Reference Guide" (PDF). p. 46. Retrieved 26 May 2014. ^ Christie, Bob (6 January 2006). "Bulletin - Rating Territories and Postal Code Changes by Canada Post (No.A - 02/06)". Financial Services Commission of Ontario. Retrieved 6 January 2007. ^ "Nouveaux codes postaux en février 2008 à Sainte-Catherine, Fossambault et Lac-Saint-Joseph" (in French). Médias Transcontinental. Retrieved 1 December 2008. ^ "Another million-letter year!". News Releases. Canada Post. 27 January 2006. Retrieved 27 April 2009. ^ "Still time to write to Santa". The Belleville Intelligencer. ^ "Canada Post – 2014 Holiday Season – Mailing Dates". canadapost.ca. ^ "Canada Post makes holiday connections easy!". Canada Post Media Relations. 4 December 2007. Archived from the original on 15 January 2011. Retrieved 27 April 2009. ^ AFP (11 December 2013). "Canada vows to protect Santa Claus from Russian troops in the Arctic". Daily Telegraph. ^ "CFE - CFSU(E)/CS/Post Office". Retrieved 7 January 2009. ^ "Canada Post - Canadian Forces Postal Service". Retrieved 1 November 2014. ^ "Study: Socio-economic status and childhood cancers other than leukemia". The Daily. Statistics Canada. 8 June 2006. Retrieved 3 July 2007. ^ "Find your Member of Parliament using your Postal Code". Parliament of Canada. Retrieved 3 July 2007. ^ "About ZIP Code A1A 1A1". Zipcode world. Retrieved 1 December 2008. ^ "Google Maps". Google.com. Retrieved 23 September 2008. This page was last edited on 30 March 2019, at 15:52 (UTC).